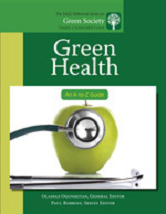 Examines the green movement within the contexts of personal health and the healthcare industry, focusing on consumer lifestyles and how they affect resource conservation, pollution prevention, and environmental management. Entries span the scope the societal goals of protecting human health and reducing the ecological footprint of healthcare. Includes a chronology, introduction, resource guide, and reader's guide.